MONTEREY> During an election year, controversial issues are debated by voters, candidates and elected officials on a daily basis. In Monterey County, there is no issue that causes more discussion than water supply and management. Whether it is Steelhead on the Carmel River, slant wells in Marina, or agricultural supply in the Salinas Valley, everyone has an opinion on water. 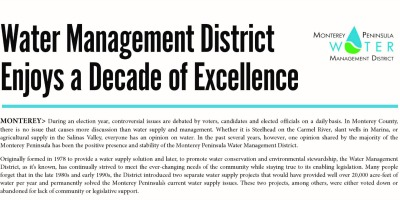 In the past several years, however, one opinion shared by the majority of theMonterey Peninsula has been the positive presence and stability of the Monterey Peninsula Water Management District. 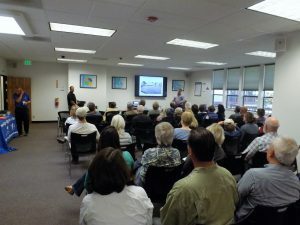 Originally formed in 1978 to provide a water supply solution and later, to promote water conservation and environmental stewardship, the Water Management District, as it’s known, has continually strived to meet the ever-changing needs of the community while staying true to its enabling legislation. 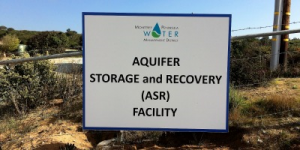 Many people forget that in the late 1980s and early 1990s, the District introduced two separate water supply projects that would have provided well over 20,000 acre-feet of water per year and permanently solved the Monterey Peninsula’s current water supply issues. These two projects, among others, were either voted down or abandoned for lack of community or legislative support. Nevertheless, the District persisted in its goal of creating new water and did so by creatively examining where this water could be found. From the expansion of the Paralta Well and the creation of the Pebble Beach Reclamation Project to the establishment of Aquifer Storage and Recovery and Pure Water Monterey Projects, the Water Management District is responsible for over 7,000 acre-feet of new water supply for the Monterey Peninsula. 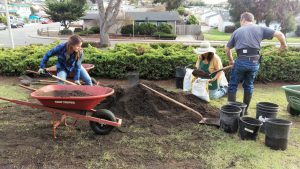 While the District was working on new water, it was also focused on making better use of the Monterey Peninsula’s existing water supply through conservation. 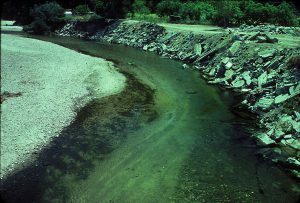 The State Water Resources Control Board’s Order in 1995, compelling the local water retailer to reduce its illegal pumping from the Carmel River, was an initial motivating factor in these efforts, but it was the recent drought that truly brought the public’s acceptance of reduced water use to its current level. Through its outreach and legislative efforts, the District helped the Monterey Peninsula reduce its overall water consumption by almost 40%. From 1997 through 2017, the residents and businesses in the area decreased usage from 15,000 acre-feet of water per year to below 9,000. The methods range from rebates for water-efficient appliances and fixtures and the distribution of thousands of free water-saving devices to mandatory retrofits for commercial properties and updated outdoor irrigation regulations. Most importantly is the fact that the tremendous reduction in use was done without rationing, a common tactic used by water agencies during times of drought. With so much change in local and regional public agencies, the Water Management District has enjoyed unprecedented stability over the past several years. Drawing on renewed mission, values, and vision statements, the special district’s staff and Board of Directors have created a culture of transparency and honest communication with its constituents, businesses, and other organizations and municipalities. Tough decisions are part of any public agency’s day, but when those decisions involve a critical public service like water, they become that much more important. Prior to making those decisions at the committee and board levels, the District often meets with the public to receive their input before formally discussing and voting on the issue at hand. “As stewards of the public’s money, the Water Management District takes its budgeting and accounting process extremely seriously,” explained the Board’s Chair, Andrew Clarke. Careful planning and proper management have not only allowed the organization to fund water supply projects like Pure Water Monterey and Pacific Grove’s Local Water Project, but also provide hundreds of thousands of dollars in water conservation grants to entities like the Monterey Peninsula Unified School District. The reporting ofthis fiscal responsibility has earned the District back to back Certificate of Achievement in Financial Reporting from the prestigious Government Finance Officers Association of the United States and Canada. The Monterey Peninsula is one of the most beautiful places in the country. That’s why millions of visitors travel here each year and its residents are fiercely protective of its natural environment. What if the private water company tasked with supplying water to those residents, businesses, and visitors was illegally over-drafting the area’s water sources and endangering flora and fauna along the way? Luckily, the Water Management District had the legislative oversight necessary to help mitigate over-pumping of the Carmel River and Seaside Basin. 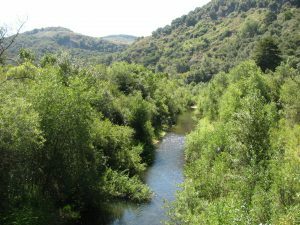 That plan, executed by following the biologists and engineers at the Water Management District has been responsible for multiple projects including repairing streambanks of the Carmel River to prevent erosion as well as restoring the riverbeds and surrounding habitat to improve conditions for the fish and animals that live there. The District’s Steelhead Rescue Team has been responsible for saving thousands of the endangered fish – 167,000 since 2008 – relocating them in the river or allowing them to flourish and grow at the Sleepy Hollow Fish Rearing Facility before their release back into the wild. Additionally, District scientists are employing state of the art monitoring technology to learn more about how to preserve the species, tagging almost 3,000 steelhead the past three years. Despite an early history filled with roadblocks to its success, the Monterey Peninsula Water Management District has emerged as the region’s leader on water. Often the first call by the publicor press requesting information on water related matters or local municipalities seeking help with water management, the District continues to serve needs of the residents, businesses, andorganizations on the Monterey Peninsula with stability, transparency, and honesty. While the personalities of its Board of Directors may change, the District is steadfast in its commitment to its mission: promote or provide for a long-term sustainable water supply, and to manage and protect water resources for the benefit of the community and the environment.